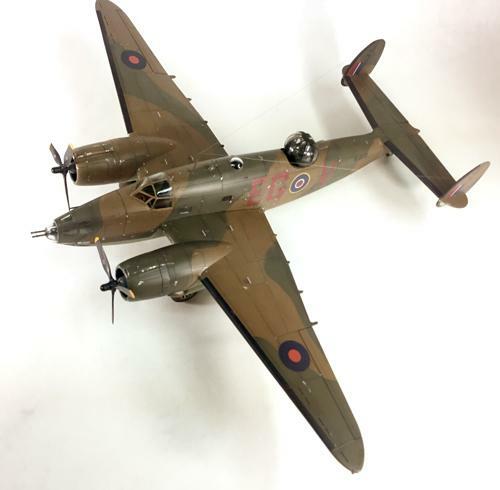 Here’s a few not so great photos of Revell’s 1/48th scale Ventura Mk. II which I completed on Christmas Eve 2017, my final build of the year. It’s a great kit and fun to construct, but it does take up a lot of shelf space and looks like a beached whale compared to the Mosquito it’s sitting next to. The kit-supplied decals are designed to look faded and are a bit thick, particularly the red lettering. I had a hard time getting them to lay flat and had to use a couple of AeroMaster replacement roundels. 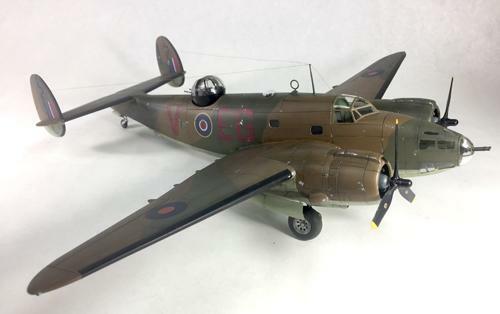 Revell did a pretty good job overall on this export version of the Ventura PV-1 – even going so far as to correct the props from that previous release and thankfully included an Eduard canopy mask. The only complaint I have is the almost total lack of detail in the cockpit. FYI: The RAF version only used one steering control column, not two as supplied here. The molded in place seatbelts are a joke. Unless you are looking in with a magnifier and flashlight, it probably doesn’t matter. Ugly as the Ventura is, this Revell domestic release is a real bargain dollar wise compared to the Revell Germany edition and a delight to build. Looks surprisingly great on the shelf despite its portly appearance. The only non-kit parts I added were Eduard Brassin wheels and a couple of Quickboost exhaust scoops. Looks like it turned out pretty well from here, Eric….I like it. I would have posted more, but after taking a few photos I nicked the antenna and that was the end of that until i repair it. Thanks for looking! Beautiful work on a not so beautiful aircraft Eric, looks like a Hudson to me. I agree with Dave a few more pics please. Thanks for the compliment. Speaking of Hudsons, I have been staring at my own personal “shelf of doom” where my stashed 1/48 Classic Airfames Hudson Mk III has been languishing for at least a decade or more. Having tackled several horrendous CA planes before, I have heard that this kit is a complete pain in the rear to build, so it just sits there. While taking photos the Ventura, I nicked the antenna which ended any more photo taking. The RAF used them on daylight raids, and paid the price. Nothing wrong with that Eric. It looks very nice. Excellent work, Eric. The Ventura was something of a workhorse, but perhaps not as a daylight bomber! Thanks for the thumbs up. Really nice PV-1 build. Came out great, always wanted to give this one a go when it came out. I have a spot in my heart for this plane b/c my dad was a Navy Patrol Bomber crewman flying out of HI during late war 1945. He was primarily assigned to PB4Y-2s but to get his extra flight pay he would log time in other aircraft. The PV series was one of them. He told stories of always being nervous in the PV b/c he said it smelled of gas all the time and was a flying gas tank, could be dangerous if u had a spark, or someone lit up..LOL! He said there were s few occasions with the PVs not coming back from a mission with no news from crew. He always thought he knew what happened…ummm wondered if he was right. Thank you for the compliment and the story about your dad. Looks great! I always think of the Hudson when I see this basic shape in British livery, but the Ventura is a nice addition. It is a nice addition. Next thing you know someone will issue a Lodestar but I’ll take a new tool Hudson first. Ugly? Certainly not! Would love to see a Hudson, in 1/32! Great work Eric! A plane we don’t see often build. In fairness,Eric, most aircraft look a bit of a beached whale next to the Mosquito. She is, how shall we say, a little fullsome around the waist. But for my money she has a charm and you’ve done her very, very proud. Huge well done (pun intended). Thanks for the compliment. And the ‘punny’ description. Yo Eric…..master model builder……..Where is that Cobra car?